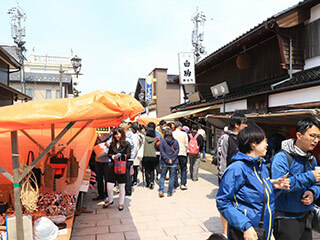 Wajima Morning Market (輪島朝市) is one of the three major morning markets in Japan. Wajima is a port and a craft man's town located in Noto Peninsula, Ishikawa Prefecture. You can enjoy fresh seafood and local products including unique craft works. There are about 200 shops open at Asaichi Street. You can enjoy the real Japanese life at the great market. Open every day except 2nd and 4th Wednesday. 1. use Express Bus to Wajima. Wajima Morning Market is one of three major morning markets in Japan. It is held at the port town of Wajima city, Ishikawa Prefecture. There are about 200 ships open at this street. There are many seafood products, local craftworks, vegetables and many other local products. You can also enjoy many foods that you can enjoy. Most of the shops are run by powerful Japanese ladies. You can enjoy great shopping at the real life works at this market. This morning market begins around Heian Period that has over 1,000 years of the history.